THE MODERATOR: Good morning. We are joined by Alabama head coach Nick Saban and Clemson head coach Dabo Swinney. Nick Saban, we’ll start with opening remarks from you. NICK SABAN: Well, first off, I’d like to thank the College Football Playoff, Bill Hancock and his staff for putting on an outstanding venue for our team here in the Bay Area. We’re obviously pleased and happy with what our team has been able to accomplish this season, to have this opportunity to play against an outstanding Clemson team. I’d like to congratulate Dabo, his team and staff for the outstanding season that they’ve had. When you play in a game like this, you expect to play against a great team, and Clemson is all of that. Our players are certainly looking forward to the challenge of playing against a really, really good team. I’m really proud of our team and actually love what our team has been able to overcome and do this year. They’ve worked hard and really had a tough road to hoe to get here, and we certainly appreciate all their effort, togetherness and things that they’ve done to be able to have this opportunity. 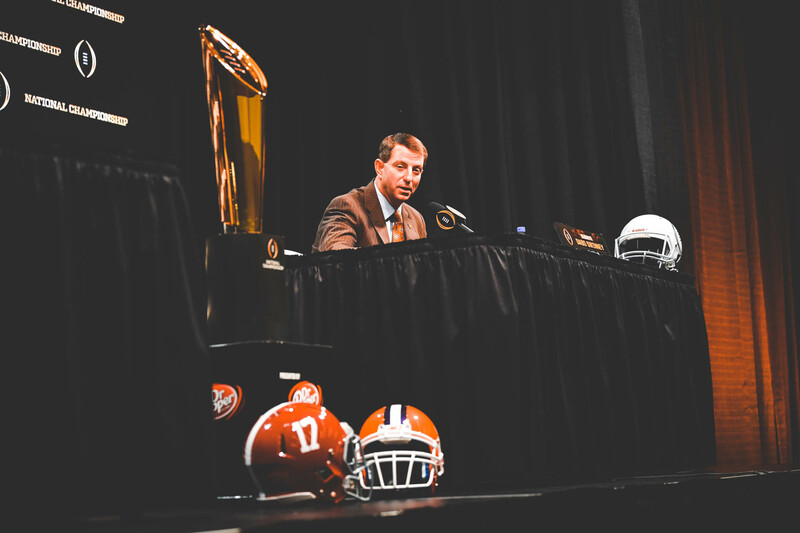 THE MODERATOR: Coach Swinney, your opening remarks? DABO SWINNEY: Thanks to all of you for being here. It’s been a wonderful couple days. Really appreciate Bill Hancock and all the CFP folks for just the tremendous amount of organization that has to go into pulling this whole thing off, to just make it as routine as possible for the two teams. So it’s been a great trip so far. Appreciate Santa Clara and San Jose, all the folks here that have worked all year to make this a great event. But really excited about the opportunity to compete against the best team in the country on the highest stage. This is what we all set out to do, 130 teams, and you have two teams that have an opportunity to compete on this stage, and we’re thankful and blessed to have this moment. Alabama has been an unbelievable champion, and Coach Saban and the consistency that they’ve had is remarkable. Not surprised at all to see them sitting back here. But really proud of our team and how we’ve performed all year long. Incredible focus. This team is blessed with great leadership and just a great group of young people that have competed every single week to get to this point. I have no doubt it’ll be a heck of a ballgame tomorrow night, two great teams that both want to win, so this is what we’re all here for. But appreciate the opportunity to be here this morning. Q. Dabo, was there a moment in your mind where you just — before you started playing Alabama in this current run, whether it’s looking at film or just seeing how you guys were developing where you said, yeah, we can play with these guys, we’re on a level with them? DABO SWINNEY: Yeah, I mean, to be honest with you, when I got the job in ’09, I felt like at Clemson, we could build a program that could compete at the highest level. We were a long way away from that. That’s for sure. But I felt like we had a few pieces in place, and we just needed to build an infrastructure, we needed to modernize our program in every sense of the word, from staff to our recruiting to our facilities, the way the administration thought. You name it. Because we were competitive, so I felt like at the very beginning that we could be a team. But for me, I felt like we needed to play a tough schedule, and that was one of my first meetings with Terry Don Phillips was hey, we play a tough schedule in our league, but if we’re going to build a great program, the only way I can prepare the team is — and listen, you can’t be afraid to fail, all right. There’s going to be some failure. But that’s a part of your growth. That’s a part of development. That’s the only way that I’m going to be able to teach these guys what it takes. So from day one, we’ve played Georgia, played Auburn four times. We’ve played Texas A&M, Notre Dame, LSU, we’ve played a lot of people in and outside of our conference that allowed us to compete and developed the program to where we could match up and have the type of postseason success that we’ve had over the past five or six years. Q. What specifically has Chase improved on since the Syracuse game, and what is your confidence level in him should he be needed on such a big stage? DABO SWINNEY: Just confidence. That’s the biggest thing. He has the knowledge, and he’s worked — he’s a redshirt freshman, so he’s had a little more time in our system, and we knew he had the knowledge, he just didn’t have really the opportunity to play yet. He’s a very talented competitor. So the biggest thing that he’s improved from that moment is just his confidence and his complete belief in himself and the team’s belief in him. We don’t have any doubt that he can go in and perform at a high level for us. We’ve got all the confidence in the world in him. Q. You both have talked at length about internal scoreboard and developing from within, but what’s allowed your players to buy in and perform on these big stages so often so consistently? NICK SABAN: Well, I think what we try to get our players to do is play to a standard, be the best version of themselves. I oftentimes get on our players, even when we win and people don’t totally understand that, because regardless of what the scoreboard says, how did you really perform? Did you perform to your best of your ability? Did you create the best value for yourself and for the team by the way you execute the discipline that you played with, how you were able to focus on the next play, not get frustrated with something that was difficult for you. To be a great competitor, you’ve got to overcome adversity. All these things create an internal standard that we’re trying to get players to play to that not necessarily is dictated by the score, who you’re playing against, but it’s about your level of performance and the standard that you play to. Oftentimes I use the example of when I was an NFL coach, they would make a highlight tape for me of a player when we were looking at him for the draft, and all that I was looking at was the plays that he played. I didn’t really know what the score was in the game, who they were playing against necessarily, what the circumstances were. I was just evaluating how that guy played on those plays that he was in the game. These kinds of things are what we want to try to get players to do to be the best version of themselves. DABO SWINNEY: Well, I think a couple things. One, we’re the same. There’s a winning performance at every position. We’re not asking them to be perfect, but there is a winning performance at each position. If you’re a wideout, that winning grade for us is 85 percent. If you’re a linebacker, it’s 80 percent. If you’re a D-lineman, it’s 75 — we have a grade. We make a big deal out of that. It’s not who we play, it’s how we play, and that’s what we talk about. And then the other thing is, so accountability to that winning performance, number one, and then the other thing is we make every game the biggest game of the year. People don’t like to hear that during the week, but if you don’t have that mindset, then that creeps in. Fans have that mindset. They look at the schedule and they go, oh, well, you’re playing Eastaboga State this week, well, now we don’t have to practice hard. Oh, we’re playing Alabama this week, okay, let’s really meet, let’s really practice hard. And if that’s your culture, then you’re going to be like this all the time. But when you make every game the biggest game of the year, and in college football it is the biggest game of the year. Everybody wants to expand these playoffs. We’ve had a playoff since September. Every game has been a playoff game to get to this point. Every game. If we’d have lost to whoever, we’re probably not here. If we had lost to Pitt in the ACC Championship, we’re not here. If we had lost to South Carolina we’re not here. Every game is a playoff game. And so for our team, we truly create that focus and that standard of performance and guys taking pride. It doesn’t matter who we play; how did you play? And we have a grade and accountability, and so now all of a sudden you don’t really get caught up in the logo of the team that you’re playing. You just try to play the very best that you can. And so when you get in these moments, whether it’s a huge game late in the season, both teams are undefeated, a lot on the line, whatever, it’s just the next big moment, because every week has been a huge moment. So that’s a mindset that you have to create, and you’ve got to get the young people to buy into and the coaches to buy into, and that tone is set from the head coach. And I think that’s one of the things that Alabama has certainly done, because you’re going to get everybody’s best every week. So if you don’t show up with that mindset, you’re inconsistent. I think however we do it, that’s what’s created the consistency in our programs for sure. Q. Dabo, I heard as a young assistant recruiting Jefferson and Shelby counties, you once went into the recruiting meeting and they asked who from your area you wanted to sign, and you had 25 guys you wanted to sign, the entire class. I’m curious if you still had that same enthusiasm for recruiting and how that has helped you as a head coach? DABO SWINNEY: That’s interesting, you’re really right on that. Recruiting has changed a lot. Back in those days nobody decided what they were going to do until January. You used to get in these recruiting meetings, and coaches lie, oh, my Lord, you’re going to get this guy, get this guy, get this guy. I figured out as a young coach, I would call 50 guys a week, 60 guys a week because what I learned is at the end of the day, some guys weren’t working like they needed to or whatever, or these guys that were sitting in these meetings saying we were going to get, then we don’t get, I’d sit here and I’d have all these guys that I’ve been working all year long and developing relationships with, so now all of a sudden some of them guys we didn’t want we were begging to get, and I was always thankful that I put that work in so that we would have some guys. Recruiting was just very different back then, very different. You had to recruit a bigger pool of people because you had no idea a lot of times until signing day what guys were going to do because most of these decisions were January, you were just recruiting seniors. We didn’t even think about evaluating a junior until May going into their senior year. It’s just very, very different times now, and we don’t recruit as big a numbers, but yeah, I loved — I was detailed in my area. I tried to know the coaches. I tried to know all my players and signed a lot of good players there when I was there for sure. Q. Dabo, earlier this week, Travis Etienne said he wanted to dedicate Monday’s game to CJ Fuller. How much is CJ on the team’s mind this weekend? DABO SWINNEY: Well, I think CJ has been on our team’s mind since he passed. It’s just a tragic situation, really tragic. You know, our thoughts and prayers continue to be with his parents, and in fact his birthday was Thanksgiving Day this year, and not long after the funeral. Just a really difficult thing for all of us. Any time you deal with death, and certainly as we get older, it’s something that we are much more aware of and experience a lot in our families and friends and so forth. But for young people, that’s a tough thing to process. But he was a great young man, and I don’t have any doubt that these guys certainly remember him and will honor him with how they play. Q. I’ve heard both of you say that in several ways you’re mirror images of one another, your teams are mirror images of one another, programs. But the way that you both got to that place are very different from a personality perspective. So I wonder, what attributes maybe have you taken from one another — this is for both of you. 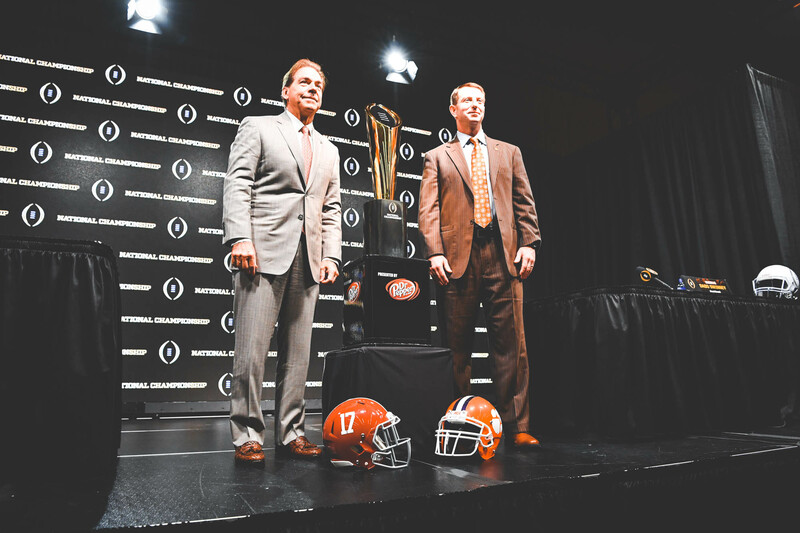 What attributes, Coach Saban, have you taken from Dabo, or Dabo from Coach Saban that maybe you’ve incorporated into your program that intrigued you that they do? NICK SABAN: Well, I have a tremendous amount of respect for what and how they do things at Clemson. They do a great job of recruiting. They do a great job of developing their players, and likewise, that’s what we try to do in our program in terms of we want to help guys be more successful in life because they were involved in the program, whether it’s through personal development, making sure they graduate, develop careers off the field, help them in career development, be the best version of themselves, see if they can have a career as a football player. And I guess there’s probably more than one way to do that. But we try to do it with a great staff of people who are interested in creating a culture of accountability for players in terms of their personal behavior, how they approach academics, how they approach what they try to do in football, and that has helped us, and we’re constantly trying to evaluate other successful programs, including Clemson’s, to see if they’re doing something that might help us improve what we do to help our players be more successful. DABO SWINNEY: Yeah, well, I think for me, that’s a lot. You’re talking about a program that I have a deep love and respect for, always have, always will, and a coach that’s — I mean, he’s won six National Championships and the level of consistency is a model and an aspiration for every program. So for me, I think a couple things: One, how he has just been himself, regardless of what people think or say or whatever. He’s been himself, and he’s stuck to the things that he believes in, and that’s a lesson for me, to be myself and to be convicted in my beliefs and how I think that I should run the program. But he’s very detailed. We’re very detailed in how we do things. And I think from a program standpoint, when he got to Alabama, how he modernized the program, infrastructure-wise, to create an environment, like he said, that’s conducive to helping the young players have a great experience and to develop as a person and a player. And there’s resources involved with that, and I think that that’s something that Coach Saban changed in college football, quite frankly. When I was an assistant, when he became the head coach and started kind of putting that in place, it was something that I paid attention to, because the old model where you had the head coach and nine assistants and a couple GA’s and you were everything, you were the coach, you were the counselor, you wore every hat. In the meantime, recruiting is still going on, problems happen, these kids are kids and they have family issues. So creating an infrastructure to support the coaches in the ultimate mission of helping these guys have that great experience but helping them get the tools they need to go dominate in life and at the same time develop as a player, and I think Coach Saban kind of led the way in that. I think as a coach, we’re always studying and trying to learn from every program, and Alabama has certainly been the standard for a decade or so since he’s been there. So I’ve learned lots of things. Sometimes it could just be maybe how he handles a situation. I’ve called on him a time or two to ask him his opinion on some things, and we’ve swapped some ideas. I’m thankful that I’ve been able to learn. And again, I learn from everyone, but I think Alabama has been incredibly consistent, and why is that? Well, they’ve recruited great players, they’ve developed those players, they’ve had a standard in place. So there are a lot of similarities, yet personality-wise maybe we’re different in how we go about certain things. But at the end of the day, I think it’s just being true to who you are. 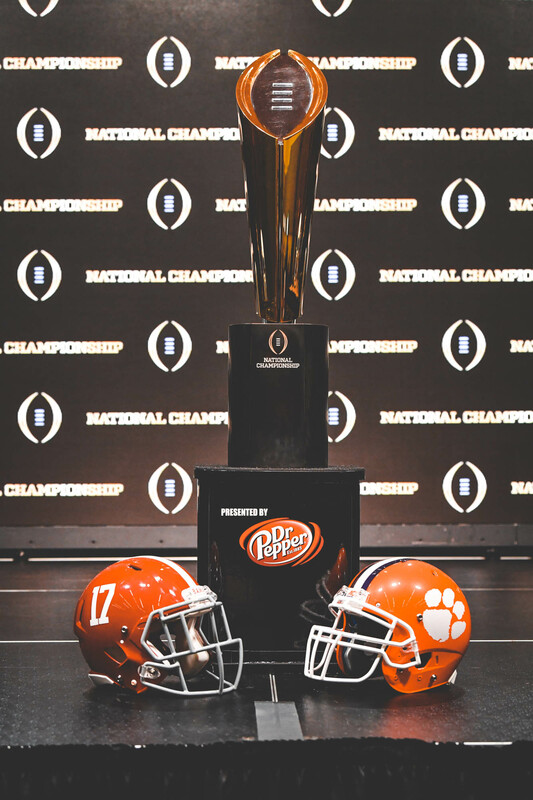 Q. Dabo, I know yesterday you had touched upon how this felt different for you from the previous championships just in terms of enjoying the road it took to get there. Do you think the players feel the same way? DABO SWINNEY: I hope so, because I really tried to be intentional in that all year, not just now but literally all year. And that was kind of a focus for me this year. I knew we were going to have a good team. I knew we would have some challenges. But this group of seniors is unlike any group I’ve ever been around. I mean, I’ve had some amazing, unbelievable individual leaders that I’ve been around, but nothing collectively like this group. I mean, 26 guys get votes for captains. This is a special team, and their focus and how they handle themselves in the off-season, in the spring, the summer, the day-to-day interaction, I just — I wanted to enjoy all of it. As I said the other day, in ’15, it was a blur. I don’t even really remember it. It was a blur, because it was very new. The preparation — our guys were in school. We had finished the bowl game, now we’ve got classes, we’re trying to get ready. It was a lot of logistical things that I kind of was figuring out as I went. We had a great game. We didn’t win, but we learned a lot. And in ’16, we knew we had a really good team, and that team, it was a little bit more of a grind. It was almost like that team wanted to hit fast forward, like can we just like get here, and it doesn’t work that way. And I didn’t think we played great early in the season, ended up losing a game. But obviously we went on to win it all. But this year, I just — this has been a very joyful season is the best way I can say it. I really have enjoyed the day-to-day, mundane activities of just being around this team, and a lot of times it’s felt like this team kind of wanted to hit pause, and I do think that they’ve enjoyed the journey. I do think this senior group has savored every moment along the way. They haven’t looked ahead. We’ve been incredibly consistent. So I don’t have any doubt that they will treasure their time this season when they finish — regardless of what happens tomorrow night, this is two great teams. Somebody is going to win and somebody is going to lose. Both teams are going to play their hearts out. And even if you win the game, been there, done that. It’s a great moment, but it’s still always about the journey to that moment and the relationships, the grind there. I think these guys have truly enjoyed every second of the ride this year, and our coaches. Q. Dabo, obviously meeting here again is great for your two programs, but is it good for college football? Is this kind of rivalry at the top good for the game, even though there’s a lack of other teams having a chance to get to this game? NICK SABAN: Well, I don’t really get too concerned about a lot of other programs. I think there’s a lot of great things about college football that creates a lot of great experiences for a lot of young men, and I think the playoff has probably minimized the number of teams that really get the same kind of positive self-gratification from going to bowl games in other venues that have been really unique to allowing players to get a lot of positives from having a good season. Now there’s a lot of focus just on the playoffs, and that becomes the target that every program and every team is sort of aiming for, and it’s certainly the target that we have and a goal that we have as a program, and we’re going to continue to have. I can’t really speak for other teams or what the impact of college football really is, but it’s my job and my responsibility to do the best job that we can for our team, our players, our program in terms of what it takes for us to be successful, and I guess that’s what we’ll continue to focus on. DABO SWINNEY: Yeah, I’d say the same thing. I mean, I’m not going to apologize for having a great team and a great program and a bunch of committed guys, and Coach Saban is not, either. I think the objective is to get the two best teams. That’s kind of the way it is. If that’s not best for college football, then why did we even do it? Why don’t we just go back to the way it was and have bowl games and you put this team against this team, and it’s not necessarily the two best teams playing, and then at the end, like it used to do, you just vote on who you think is the best team. That’s what we used to have. So then everybody got mad and said, dang, we want to put the best team against the best team. So I think the first time that happened was my senior year, us and Miami, I believe, when they said, all right, we’re going to start this new thing and put one and two together and do away with all these bowl affiliations, tired of all these people just saying, all right, we elect you national champion. We’re not going to vote on it anymore, we’re going to earn it and settle it on the field and put the two best teams together. So that’s what I think the objective was, so that’s what’s happened. I think the two best teams — I think it works. We went to a playoff, and the two best teams are here, and the two best teams have been here every year. Last year the two best teams were there. So I think that’s what college football wanted, and also being able to have some great match-ups in bowl games and things like that. I think it’s great that there’s, whatever, 40 teams out there that can end their season with a win and have momentum going into the off-season and so forth. If this isn’t good for college football, the two best teams, then we just kind of go back to the way it used to be and create all the good match-ups however you want them and then you just kind of elect a captain and you’ve got one national champion in this poll and one national champion in this poll and one national champion in this poll. Q. Coach Swinney, you’ve recruited elite quarterbacks before, including five-star guys. When did you know you had something different, something special in Trevor Lawrence? DABO SWINNEY: Well, it was pretty obvious. I really started studying him his sophomore year in high school. It was pretty obvious that he was an elite talent, skill-set wise, but I like to get to know these guys a little bit and what’s their mental makeup and so forth. And I think you can get somewhat of a feel for that, but I don’t think you really ever know until you start coaching a guy and you transition. That first spring when, I mean, day one installation, you kind of have an installation plan of how you’re going to put in your systems, offensively, defensively and so forth, and I mean, he got day one like that. It was like fish to water, just natural. His uniqueness from a mindset standpoint, his poise, his demeanor, his preparedness and just his — it was amazing to me early. It’s easy to see him go out there and throw the ball, and you’re not going to ever see anybody throw the ball that looks better throwing the ball. I mean, it’s a beautiful thing of art to watch this kid spin it, and he’s 6’6″, he’s got all these physical measurables and attributes. But it’s the stuff that’s harder to measure. That first spring, just meetings, how he transitioned, speed of the game, how he handled mistakes, how he handled the pressure from his teammates, how he handled competition. I mean, we had a bunch of quarterbacks there last spring, and I knew pretty early that this kid is — he’s unique.